It's easy to see how eating meat harms animals, but many people struggle to understand how dairy could cause any harm. The truth is that the dairy industry leads just as inevitably to death as the meat industry does, and often with more suffering for the animals before they get to slaughter. As dairy cows only produce milk for about 10 months after giving birth, they are impregnated annually to keep up the milk flow. 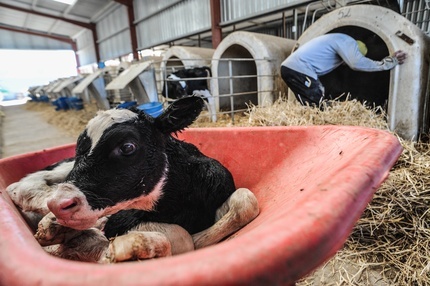 Female calves are kept to replenish the herd, and male calves are either left to die or are sent to veal crates, where they live a miserable, dark, and lonely existence until their slaughter. When dairy cows become unable to produce adequate amounts of milk they are sent to slaughter and turned into low-quality ground beef. Veal calves are kept in small wooden crates which prevent movement and inhibit muscle growth so that their flesh will be tender. They are fed an iron deficient diet which makes them anemic in order to keep their flesh pale, which is for some reason, appealing to the consumer. Veal calves spend their whole short lives in confinement, alone and deprived of light for a large portion of their four-month lives. 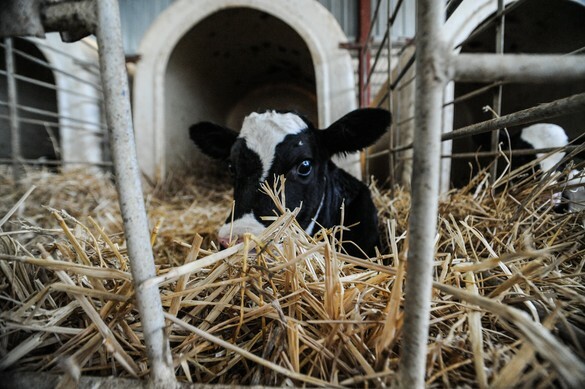 Veal calves are a “by-product” of the dairy industry.